Cassandra Brooks has long wanted one of her videos from Antarctica's Ross Sea to go viral. She broke the ice in May 2013 with a striking five-minute film that surpassed 500,000 plays on YouTube within two weeks. 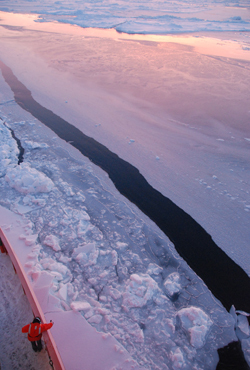 The video, titled "Two months breaking ice (in under five minutes)," captures stark scenes that changed daily—often hourly—as the National Science Foundation icebreaker Nathaniel B. Palmer plowed through the ice of Antarctica's nearly pristine Ross Sea. Brooks, who graduated from the Science Communication Program in 2009, was aboard the vessel as both a marine scientist and a communicator. 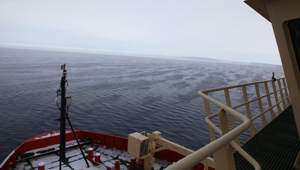 Researchers on the expedition tracked the Ross Sea's annual intense blooms of marine phytoplankton, the base of its prolific food chain of fish, marine mammals, penguins, and seabirds. She blogged about her experiences for the online NewsWatch pages of National Geographic. The film features sped-up footage of various types of ice, dynamic channels that serve as conduits for life, massive icebergs, and "polynyas"—large seasonal patches of open ocean in which the researchers tracked the algal blooms. Ubiquitous penguins pop up in the video, especially in an extended closing sequence. Still shots taken by Brooks capture some scenic ice or sky conditions. Brooks edited the video from dozens of hours captured by a Go Pro video camera mounted on the ship's upper deck railing, shooting frames at 2-second intervals. In the cold and wind, she reports, the camera's batteries typically lasted an hour, maybe two. The video gained traction on YouTube after it was spotlighted in major media outlets, including the New York Times, the Washington Post, CNN, Popular Science, Smithsonian, LiveScience.com, Boing Boing, BBC, and The Atlantic. "Doing research in the Antarctic is an incredible privilege and one I've always tried to share with those I love and with the greater public," Brooks says. "With the icebreaking video, I tried to capture my two months at sea—the mesmerizing scenes ever changing as summer turned to fall, day turned to night, and the ice grew thicker every day—and share that beauty." Editing the film took weeks, Brooks says, but the reward was nearly instantaneous. "I had absolutely no idea that within days of posting it on YouTube, the video would spread across the country and then the globe," she says. "I'm flattered and delighted that so many people have enjoyed it. 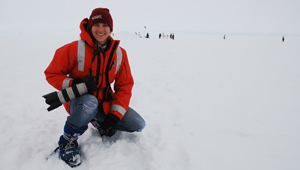 I hope this lens has inspired support for Antarctic science and conservation." Music for the video was composed by Nik Sawe, a classmate of Brooks at Stanford University. Brooks is now pursuing a Ph.D. in marine and environmental policy at Stanford's Emmett Interdisciplinary Program in Environment and Resources.